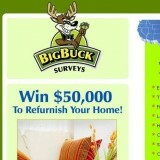 “BigBuck Surveys” and found on bigbucksurveys.com, is a paid surveys and offers site owned and operated by Vente, Inc. out of Omaha Nebraska, a part of QInteractive in Chicago. It’s a bit different in how other survey/offer sites work in that they have you engage in offers and product trials. The interesting part of being owned by Vente is that Big Buck Surveys collects consumer leads which Vente can sell for marketing purposes. This means any information you give BigBucks Surveys will surely be gathered by Vente so their clients can try to sell you stuff. Real survey sites are hired by market research companies to gather opinions of consumers willing to participate in survey panels and discussion forums in exchange for rewards. Most of them will keep your data private unless you agree to share it. One of the things to look for in a survey site is have you complete offers or sign up for product trials. That will tell you that it’s not really a real survey site. “Big Buck Surveys” falls into this category. A warning about offers sites is that sometimes they have you pay something for the products you test. If you don’t return the products before a specified deadline you will usually be charged for it. Anything you do get paid for takes Big Buck Surveys about six to eight weeks to get paid on. Another thing at issue is the offer of twenty dollars to participate in a study. What they actually did is send me a link for $20 off a $60 purchase at Omaha Steaks. When I tried to contact them I got no response. For the little to nothing I’ve received in exchange for my opinions, I can think of many other paid survey sites I’d rather waste my time on than BigBuck Surveys.